Steven Solomon, Author of, Water: The Epic Struggle, Talked with Sharon Kleyne, founder of Bio Logic Aqua Research and host of Sharon Kleyne Hour, on World Water Day 2010. "United Nations World Water Day (March 22) offers an opportunity become educated on the vital importance of water in every aspect of our lives," says water advocate Sharon Kleyne, host of the Sharon Kleyne Hour Power of Water syndicated radio talk show and founder of Bio Logic Aqua Research. According to Mrs. Kleyne, one of the most comprehensive and readable books about water is Steven Solomon's classic, Water: the Epic Struggle for Wealth, Power and Civilization (Harper Collins 2009). Mrs. Kleyne interviewed Steven Solomon, in Rome at the time, on World Water Day 2010. They discussed water wars, water scarcity, and global water politics. 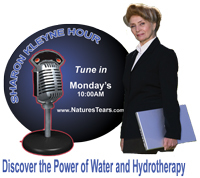 Sharon Kleyne's March 22, 2010 interview with Steven Solomon, on the Sharon Kleyne Hour Power of Water, may be heard on-demand on World Talk Radio, Voice America, Green Talk Network and Apple iTunes. In his book, Steven Solomon describes water as "Earth's most indispensable resource." Water is critical to human survival and economic prosperity, and more important than oil. Mr. Solomon talked about the fascinating connection between United Nations World Water Day, The Hague, Netherlands, where many UN offices are located, the Netherlands' long history of water management, and Democracy in the United States. In the 1300's, according to Mr. Solomon, the Dutch turned over management of their extensive system of canals, dikes, water impoundments, irrigation systems, reclamation projects and harbors to locally elected Water Boards. The Water Boards evolved into a parliamentary system that made the Netherlands, in the 1500's, the world's only functioning democracy and one of the world's wealthiest (and most water rich) nations. This tradition was transplanted to the North American Dutch colonies and influenced the United States Constitution. Mr. Solomon talked at length about the connection between governmental power and control of water. He cited Egypt and the Nile as an extreme example of government controlling the people by controlling the water, but says the same is true virtually everywhere. Yemen, Mr. Solomon noted, is one of the world's most water-poor places and has 23 million people living mostly in parched desert. The capital, Sana, has been growing rapidly because of the national water crisis but has a severe water shortage of its own. The constant power struggles in Yemen, he states, are ultimately water wars between factions attempting to control the water. The same is true in Pakistan, Afghanistan and numerous other places. In Iraq, according to Mr. Solomon, Saddam Hussein starved or displaced thousands of Marsh Arabs by diverting water from wetlands in the Tigris-Euphrates delta (believed by some to have been the site of the Garden of Eden) and poisoning the remaining water with pesticide, reducing the wetlands by 90%. The wetlands have since been 60% restored. Water wars are also a factor in US politics, says Mr. Solomon. Imported water is critical to desert cities such as Phoenix, Las Vegas and Los Angeles. West of the Mississippi, most of the water is controlled by Colorado, Washington State and Canada. Inside California, political wars rage over whether to allocate scarce water for cities or for agriculture. Sharon Kleyne noted that 1.6 billion people worldwide lack access to abundant and sanitary water (http://www.un.org/waterforlifedecade/scarcity.shtml). Ironically, she says, most Americans do not drink the recommended eight to ten glasses of water per day even when available and inexpensive. Sharon Kleyne and Steven Solomon agreed that you cannot drink or grow crops from oil. Sharon Kleyne Hour Power of Water is sponsored by Bio-Logic Aqua Research, whose Nature's Tears® EyeMist® is an all-natural, all-water, personal, hand-held humidifying device for dry eye. Nature’s Tears® EyeMist® is available at http://www.BioLogicAqua.com, Amazon.com, drugstore.com and selected drugstores nationwide.